In recent years, quinoa (pronounced keen-wah) has become a buzzword among the health-conscious. Considered a trendy superfood, quinoa’s superior make-up earns its status. Quinoa, a seed among grains, can be served hot or cold, and is typically boiled in the same manner as rice. It is simple to prepare and makes for a great substitute to other grains that might not be as nutritionally complete, such as wheat and rice. Quinoa is coated in saponins, which are bitter-tasting compounds that act as a natural pesticide. Because of this, it is important to thoroughly rinse and soak quinoa before cooking. Saponins are found in other vegetables as well–they are the agents that cause foaming and mimic a soapy lather when these foods are rinsed with water. The three main varieties of quinoa are white, red, and black, with white quinoa being the most common and readily available in stores. Quinoa is also sold in flake form and can also be purchased as a flour, commonly used in gluten-free baked goods. Researchers trace quinoa’s roots back to the Inca Empire of the Andes region of South America, 3000 B.C. (present day Venezuela, Colombia, Ecuador, Peru, Bolivia, Argentina and Chile). It is in this region that quinoa thrived; in 3000 B.C., approximately 250 varieties of quinoa grew know here how to be healthy 2018. Long before greenhouses and technology made cultivation easier, quinoa was harvested in a variety of climates. Its tolerance for multiple growing conditions made it a food of choice among the ancients, thriving in high altitudes, tolerating hot sun, and surviving chilling freezes. Additionally, all parts of the plant are edible, though today it is mainly the seeds that are packaged and sold. The traditional Andean cultures regarded quinoa as both a food as well as a medicinal plant. Quinoa is a demulcent (or anti-inflammatory) grain; it protects mucous membranes as well as the lining of internal organs. Ancient cultures have used quinoa to ease sour stomachs, treat constipation, and provide remedies for tuberculosis and gonorrhea. Most quinoa sold in the U.S. still comes from South America today, but presently there is an estimate of over 1,800 varieties of quinoa available worldwide. Quinoa has a reputation for being nutrient-dense, with a profile that mimics grains but differs in a few key areas. Quinoa is grouped with grains due to the manner in which it is typically eaten, but in technical terms, quinoa is considered a “pseudocereal.” Pseudocereals are a subgroup of foods that are not quite grains, but can be easily ground into flour in the same way grains can. Quinoa can be served as both sweet and savory, and can provide a gluten-free alternative for other typically-glutenous grains. 1. It’s a complete protein containing all 9 essential amino acids. Arguably the most well-known attribute of quinoa is that it is a “complete protein,” containing all 9 essential amino acids. This sets it apart from other grains and plantfoods. Amino acids are the building blocks of life and are digested and transformed into proteins in the human body. Amino acids can break down food, repair body tissue, and be used as a source of energy, among other important functions. The average sedentary American needs between 46-56 grams of protein daily. The more active you are, the more protein your body requires. To calculate your individual protein needs, plug in your numbers into this calculator. Chronic inflammation can sap energy and increase the risk of cardiovascular and other chronic diseases. Certain antioxidants can prevent, protect against, and reduce inflammation. Quinoa contains these particular antioxidants, known as flavanoids. Flavanoids come from plant sources. Scientists believe that one of those flavanoids–polyphenols–can reduce the risk of cancer, osteoporosis, type 2 diabetes, and heart disease. Quercetin has also been found to decrease inflammation markers in the blood, which proves it effectiveness in reducing inflammation. Key Takeaway: Quinoa’s antioxidants and flavanoids are linked to lower rates of inflammation and reduced risk of certain diseases like arthritis and other diseases of the joints. 3. It helps trim your waistline. One of today’s biggest health epidemics is obesity. More than 36.5% of U.S. adults are obese, according to the Centers for Disease Control and Prevention (CDC). Obesity contributes to some of the leading causes of preventable death in the U.S., including heart disease, type 2 diabetes, and various cancers. Both exercise and nutrition are key to maintaining a healthy weight, but when put to the test, diet is considered the more important factor, specifically a diet rich in fiber. An average taken from 4 varieties of quinoa found that per 100 grams of (raw) quinoa, there are 10-16 grams of fiber. About 1.5 of those grams of fiber are soluble fiber. Soluble fiber attracts water and slows down the rate of digestion, which has been shown to reduce appetite, aid weight loss efforts, and reduce cholesterol. After quinoa is boiled, it contains about 5 grams of fiber, as it absorbs a large amount of water during cooking. Because fiber promotes a feeling of fullness, it can help reduce the risk of overeating and in turn, reduce rates of obesity. The RDI of fiber for a 2,000-calorie diet is 28 grams, however, Americans on average consume only 15 grams of fiber each day. The Standard American Diet, which is largely comprised of processed foods rather than plant-based whole foods, accounts for some of these fiber deficiencies. Consuming whole foods like quinoa helps to counteract these deficiencies. 4. It’s an iron-rich plantfood. Iron is typically linked to red meat, but for a plant, quinoa contains an impressive amount of it. Key Takeaway: Quinoa is a great source of iron, higher than most other plantfoods, and can help combat iron deficiency. Be sure to soak in water before eating to retain its nutritional excellence. 5. It’s also rich in magnesium. Magnesium is necessary for over 300 biochemical reactions in the human body, most notably biochemical reactions related to the health of nerves, muscles, bones, and the immune system. It is estimated that up to 80% of people have a magnesium deficiency. As such, magnesium has become quite a buzzword in recent years. Conditions related to low magnesium include depression, chronic fatigue, epilepsy, parkinson’s, sleep disorders, cluster headaches, osteoporosis, chest pain, type 2 diabetes, asthma, and more. Again, as mentioned previously, beware of phytic acid. As recommended above, soaking quinoa before preparing and eating will help to retain its vital nutrients. Key Takeaway: Quinoa is a great source of magnesium, which is a nutrient about 80% of people are deficient in. Be sure to soak quinoa in water before eating to maximize nutritional benefits. 6. One serving contains over half of your daily requirement of manganese. Manganese is important for the health and function of the bones, kidneys, liver, and pancreas. It is only present in small amounts in the body on its own, and low levels of it can cause a variety of health problems, including infertility, bone disease, and seizures. It is also linked to premenstrual syndrome (PMS), diabetes, and epilepsy. Manganese is a critical mineral to brain health, nerve function, regulating blood glucose levels, and the metabolism of fats and carbohydrates. It is estimated that close to 40% of the general population does not get adequate amounts of manganese from their diet. The Standard American Diet contains more refined grains than whole grains, which at least partially accounts for this deficiency. Key Takeaway: Quinoa has an abundant amount of manganese, a mineral that up to 40% of people are deficient in. Be sure to soak quinoa in water before eating to receive the maximum levels of this mineral. 7. It has a low glycemic index. The American Diabetes Association estimates that about 86 million people in the U.S. have diabetes, a complication of high blood sugar. Heightened blood sugar can cause damage to the pancreas, affecting its ability to produce insulin. It can also cause atherosclerosis–the hardening of blood vessels. Foods that fall under a glycemic index of 55 are considered “low-glycemic range.” Quinoa has a glycemic index of 53, qualifying it as a low-glycemic food. Part of the secret of its low number is its high amount of fiber. One benefit of fibrous foods is that they slow down the movement of food through the system, which in turn reduces the rate of sugar absorption. Key Takeaway: Quinoa has a low glycemic index, which means that your blood sugar won’t spike after eating it. This is especially important for diabetics and those that are monitoring their sugar intake. 8. It contains essential B vitamins. Quinoa is also an exemplary source of B vitamins. It contains an impressive amount of B1 (known commonly as both thiamine and thiamin), B2 (riboflavin), and B6, among lesser amounts of other B vitamins. B vitamins are extremely important to our health. They are water soluble, meaning the body does not store them for later use. Due to their water solubility, the body requires replenishing of B vitamins from food, as leftover amounts are discarded through urination. B vitamins are known to strengthen the immune system. Vitamin B1 plays an important role in metabolizing energy. Most people rarely experience a B1 deficiency, however, symptoms of a deficiency include headache, fatigue, irritability, and abdominal discomfort. Vitamin B6 creates antibodies to fight against disease, makes hemoglobin (which carries oxygen to tissues in the body), breaks down proteins, and regulates blood glucose levels. Key Takeaway: Quinoa is a source of B vitamins and consuming it can help maintain the levels of B vitamins in the body, as B vitamins are water soluble and require consistent replenishing. 9. It’s ideal for those with dietary restrictions, especially the gluten-free and vegan. Gluten is the only known protein that is completely indigestible, and in people with allergies and sensitivities to it, gluten can cause inflammation. Inflammation and other complications occur when gluten molecules slip through the intestinal lining whole. 10. It boosts energy, mood, and works as an antidepressant. It is clear that the physical body benefits from superfoods like quinoa, but research also suggests that quinoa might be considered “brain food.” Some scientists have seen a link between foods with a high mineral content and the reduction and treatment of symptoms of mild to moderate depression. It is believed that the high mineral content boosts serotonin levels in the brain. Serotonin is a neurotransmitter, and scientists believe it plays a role in regulating mood. (28) Low serotonin levels may contribute to depression, which has such symptoms as sadness, fatigue, irritability, and loss of interest in previously-enjoyed activities. Key Takeaway: Quinoa promotes mental health by raising energy levels, serotonin, and reducing fatigue and anaemia. Unlike some superfoods, quinoa is extremely accessible. It is sold at national grocery chains and like its fellow grains, it can be purchased in bulk as well as in convenient, pre-seasoned, ready-to-cook packets. Because its texture so closely mimics oatmeal, cous-cous, rice, bulgar, and barley, quinoa can be cooked in a variety of ways to please a variety of palettes. Its versatility makes it easy to incorporate into your everyday diet, standing in for any dish that traditionally uses grains. 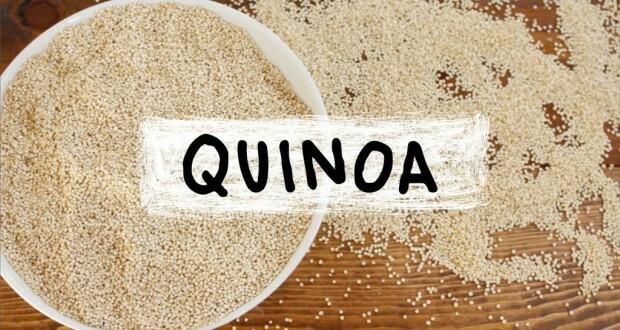 Add quinoa as an ingredient to your appetizers, snacks, sides, soups, dinners, and desserts. It’s gluten-free, cholesterol-free, vegan, protein-rich, magnesium-rich, iron-rich, fiber-rich, antioxidant-rich, filling, easy to prepare, low-fat, and lowers the risk of cardiovascular disease, high blood pressure, and even certain cancers. (31) With such an excellent rap sheet, it is no wonder it has been a staple in the South American diet since 3000 B.C. As always, a diet rich in a variety of foods is healthiest, so quinoa should not be used as a total replacement for all grains and proteins. However, consumed along with a diet that includes unprocessed whole foods such as fruits, vegetables, and other healthy grains and proteins, it is a healthy, smart choice. Start incorporating this nutritious superfood into your everyday diet today. Remember to soak your quinoa before cooking. Soaking helps twofold: it removes the bitter flavor of the saponins and reduces the chance of digestive irritation sometimes attributed to this phytochemical. (32) It also helps the quinoa retain its essential nutrients. Quinoa’s popularity ensures that there is no shortage of recipes to try. Here are a select few to get you started. Quinoa is a great alternative to oatmeal. Pack some extra protein into your morning for some long-lasting energy. Substitute soy, almond, or coconut milk to make this a well-rounded vegan breakfast. For Chai tea latte-lovers, this meal combines the fragrance of cardamom, allspice, cloves, and ginger, the protein of quinoa, and the sweetness of brown sugar and coconut flakes. Indulge in this sweet treat for a powerhouse breakfast, or enjoy it as a healthy and nutritious dessert alternative. Replace the traditional bulgar with quinoa in this recipe for a nutritious, gluten-free twist on this Mediterranean classic. Punch up your traditional pilaf with this quinoa version and serve on the side of a lean protein of your choosing for a max-protein meal. Here’s a vibrant green dish that combines the powerful protein of quinoa with the added protein of chickpeas. Try this hearty soup recipe, and switch out with seasonal veggies to keep it tasty and budget-friendly any time of year. Consider adding this meatless alternative to your repertoire. Quinoa, bread crumbs, fresh veggies, and cheese makes for a satisfying Meatless Monday idea. There are so many ways to enjoy the health benefits of quinoa. Quinoa is an outstanding, scientifically-backed superfood that is easy to cook, readily available, and filling to boot. With recipe options from breakfast to dinner, cold to hot, and soups to stews, it has never been easier to ensure that your nutritional needs have been met.